The temperature in the car was reading 35 degrees as we travelled at a snail’s pace around the M25. 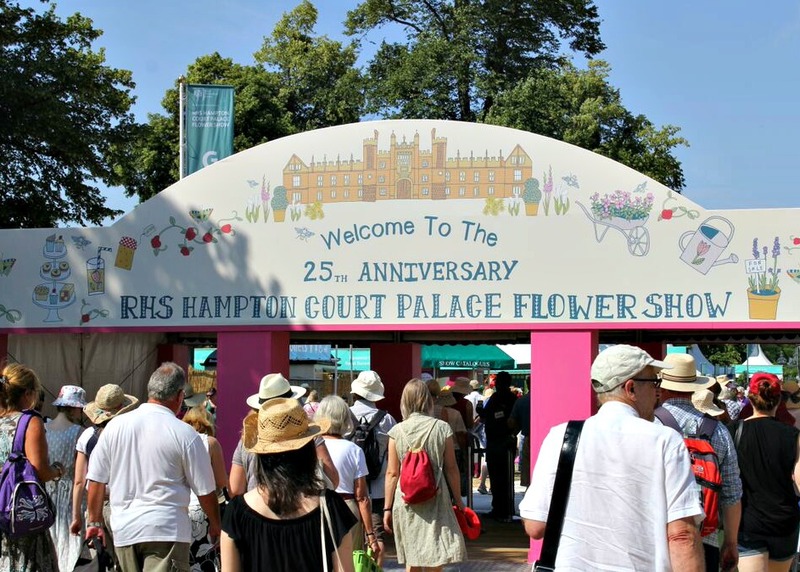 But with the air conditioning and radio on full blast, spirits were high as 1st July had been a date in our diary for months; we were finally going to the RHS Hampton Court Palace Flower Show. This was our first time. We had previously been to the Chelsea Flower Show, but I was particularly excited as I had heard that this was the show for amateur gardeners. Also, with my college days coming to an end, the question of where to go next is looming. So I was keen to breathe in all things horticulture, check out the various nurseries and start forming my own battleplan. The first thing that struck us was how beautiful the grounds are and how huge the space is. A lake breaks up the landscape, creating pockets for different stalls and displays, making it all the more rewarding when you stumble into a newly-discovered area of flowers, colours and fragrances. The designers’ immaculate gardens, a towering birthday cake made entirely from begonias and Tony Smith’s ‘all senses experience’ 25th Anniversary maze, is something to behold. But this year, much to my delight, the theme is very much about wild flowers and bulbs. People are recognising the importance of bug havens in our ever-decreasing countryside. Flowers for butterflies, flowers for bees, flowers that create a little disorder in those once pristine and perfectly-trimmed beds. Out with the petunia and in with the cornflower. I have nothing against the traditional Victorian border, I work on them in Regent’s Park and they have their place, but to see our meadow and cottage flowers being championed by some of the largest nurseries and garden designers, for me it’s a welcome sight. However, the biggest highlight for us was one of the talks. From chef to gardener to John Craven (I kid you not, bring back Saturday Superstore I say), they were all there peddling their wares with useful insights and life experiences. But the one person we were eager to see was the lovely Alys Fowler. Her attitude towards nature and gardening was fundamental in the design of our own garden six years ago. Growing our carrots alongside our marigolds, not only to make the most of our limited space, but to help nature work in harmony, was something we had never considered. Thanks to her brilliant TV series The Edible Garden, we realised we could get so much more from the smallest of spaces; vegetables and flowers working together in perfect harmony. Alongside the gardening God (let us take a moment) that is Monty Don, Alys has been a huge influence for us. Despite the 30 degree heat in a very clammy tent, Alys gave a inspirational talk on salad leaves, what you can do with them and the many leaves you can actually eat. Who knew that the spritely aquilegia could find its way onto the dinner plate? Once the talk was over, like nervous teenage groupies, we seized the moment to go over to her book signing and introduce ourselves. What we thought would be a simple signing of her book Abundance, and a heartfelt ‘thank you’, turned into a lovely conversation of all things gardening, bees and canals (if you check out Alys on Instragram, it’ll all become clear). But most importantly, we got to say thank you for unintentionally being our garden designer! And for inspiring us to turn our tiny back garden into something productive and wonderful. The rest of the afternoon was spent wandering around the stalls and gardens, touching, smelling and drawing up huge wish-lists for both the garden and the allotment. Despite the blazing heat, the crowds were relaxed, slow-paced and polite. We gardeners are a wonderful breed, are we not? Sounds like the show to go to, I went to Chelsea for the first time this year but I’m definitely an amateur 😉 Very jealous of you meeting Alys Fowler, she’s great…I’m hoping my allotment will grow up to be like hers one day;) Thanks for the lovely post. You’re very welcome, and thank you for the lovely message! 🙂 We would highly recommend going to Hampton Court, it has quite a different vibe to Chelsea. Now, I know what to do with my spare marigolds (plant them next to the carrots! ).